Here is a wonderful video from a young Indian artist ‘StringSick’. Just brilliant work! A must see. The lyrics are really beautiful. And the photo compilation is … Well I have no words to describing them. It’s sometimes unbelievable to see the realities of the world. The song touches your heart while the video rips it apart! OK this post has been due for like 5 days. Everyday I used to say like I will do it today. But work pressure is so much that it was really impossible. I am sleeping at 3-4 O’clock in the morning for last couple of days. In that regard there is a news (Good or Bad I can’t really tell.) I have given 3 months notice to my current employer. So from May onwards I will be working only for my own firm. No more 2 jobs thing. I just can’t wait to see these three months finish. And in all of the above, I forgot to tell you that this post is an update post to the New Year! New Resolution! Post. In that post I told you about this bet according to which I was required to loose 5 Kgs in one month. Well guys I am pleased to say that I have achieved that target. On the weighing day my weight was 78.81 which is 6.900 Kgs (That is almost 7Kgs!) less than the previous weight. new weight with signature and all. New Slimmer (but not slim enough) Me. 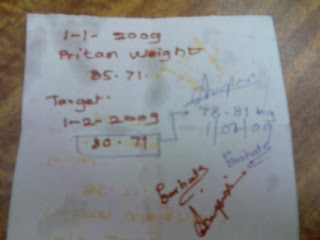 On 29th I was still 90 grams short of the target and I was majorly [Ya I know there is no such word as majorly. 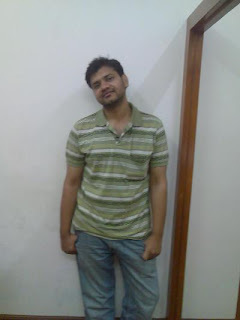 It’s just that Tushar keeps using the phrase – there was this cute chic in …. Majorly hot man! Majorly Hot!] pissed [No pun intended. And am I writing a bit too much in brackets? I love it, writing in brackets. In fact I think a cool name for this blog would be – Writing in the Brackets ;-) and yes if you have forgotten what the original sentence was: I was majorly pissed.] So in all my fury I cursed God [in whom I don’t believe] for being unfair to me and went on even harder diet and drank only a sip or two of water only when necessary [plus 1 or 2 glasses of buttermilk and 2-3 chai (with out sugar but with lots of Sugerfree – and that was a bracket within bracket – I am great)]. And then the weighing day came. 1 Feb 2009! I spent extra 10 minutes in the toilet to make sure I wasn't carrying any "dead weight". And I consumed only half a liter of water and 3 cups of tea in that day. I was feeling damn low on calories. I was getting irritated quite often. But it was a bet and I had to win. So I told myself to stay calm and not to do anything rash. I was waiting like mad for 6 O’clock in the evening. Then finally at 6 O’clock in the evening I called up Archana and told her that I was coming to pick her up. Poor girl was ill but I dragged her to Corn Club where I had weighed previously. And … You know the rest of the story….